They didn’t just make every AlDub fan fall in love on the first day they met as a love team inKalyeserye, but they also proved that ‘destiny’ real! The on-screen sweethearts had their first concert together with Eat Bulaga! family last year at the Philippine Arena. Dubbed as ‘Sa Tamang Panahon’, AlDub’s concert was hailed as the grandest event of a love team in the country. It also made another history for garnering 39.5 million tweets. This is probably one of the most remarkable milestones of Alden and Maine’s tandem! People were surprised when they found out that the two young superstars flew to Boracay last March. Apparently, Maine’s thoughtful partner brought her to an exclusive getaway at the beach as a birthday present. Here’s another fun fact: reliable source said that Alden paid for everything. Sweet, right? The phenomenal love team’s movie ‘Imagine You and Me’ must be included in this list! This big project of Alden and Maine brought us to Italy and gave us an addicting kind of kilig. Yesterday, Eat Bulaga! announced on social media that Maine finally “said yes” to Alden. Even thought the shocking revelation was announced on the social media platforms of the noontime show, a lot of die hard fans believe that it was for real! 100 Most Beautiful Women in the Philippines for 2016 – Voting for the 10 Finalists Now Open! Daniel Padilla is 2016 Cover Guy of the Year! Ts0st0pain pala sana ni Kathryn Bernardo si Daniel Padilla. Kaso ang kapal ng K00pal ni DJ kaya nandiri sa Kathryn……SUPOT pa kasi bwahahahahahah!!!!!! DJ SUPOT!!!!!! !DJ SUPOT!!!!!! !DJ SUPOT!!!!!! !DJ SUPOT!!!!!! !DJ SUPOT!!!!!! !DJ SUPOT!!!!!! !DJ SUPOT!!!!!! !DJ SUPOT!!!!!! !DJ SUPOT!!!!!! !DJ SUPOT!!!!!! !DJ SUPOT!!!!!! !DJ SUPOT!!!!!! !DJ SUPOT!!!!!! !DJ SUPOT!!!!!! !DJ SUPOT!!!!!! !DJ SUPOT!!!!!!! patuli ka na para di ka k00palin. bwahahahahahahah!!!!!! JADINE – Team Real!!!! LizQuen – Team Kilig!!!! 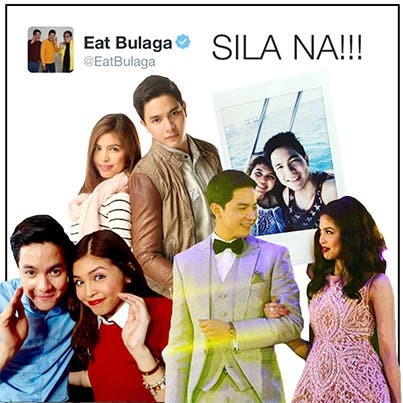 Aldub – Team Love!!!!! oy basher hwag mo ng isali si maine sa negative comment mo.dahil siya ay mabuting tao and is guided by mama mary,so pray and be more positive.peace! Dolce Amore sa Kazakhstan. dami ng sikat na loveteam, Jadine, Lizquen, Aldub, KimXi……di tulad ni Daniel Padilla SUPOT pa din!!!!!! laos na laos na ang tambalang Kathniel……Ulikba at SUPOT kasi….bwahahahahaah!!!!! DJ SUPOT!!!! !DJ SUPOT!!!! !DJ SUPOT!!!! !DJ SUPOT!!!! !DJ SUPOT!!!! !DJ SUPOT!!!! !DJ SUPOT!!!! !DJ SUPOT!!!! !DJ SUPOT!!!! !DJ SUPOT!!!! !DJ SUPOT!!!! !DJ SUPOT!!!! !DJ SUPOT!!!! !DJ SUPOT!!!!! Napakabansot pala ni James kaya hubad ng hubad at laplap lang ang alam, kain pa ng century tuna para tumangkad at tumaas ang rating ng TIMY tatalunin pa ng ALDUB , tinalo na nga ng LIZQUEN hahahahhuhuhuhhihihi…BANSOT!!!!! Congrats Alden and Maine sa lahat ng accomplishments. DJ SUPOT!!!! !DJ SUPOT!!!! !DJ SUPOT!!!! !DJ SUPOT!!!! !DJ SUPOT!!!! !DJ SUPOT!!!! !DJ SUPOT!!!! !DJ SUPOT!!!! !DJ SUPOT!!!! !DJ SUPOT!!!! !DJ SUPOT!!!! !DJ SUPOT!!!! !DJ SUPOT!!!! !DJ SUPOT!!!! !DJ SUPOT!!!! !DJ SUPOT!!!!! Bakla pala ang type ni Maine. Tsk!